Samsung kept their promise made at the Mobile Unpacked 2 Event and has now released the first official Android 4.3 update for Samsung Galaxy S4 I9505, the LTE version. The first update was released in Germany, but the rest of the countries are going to get the update in a short while. Let’s start with what’s new in this update. Samsung isn’t providing an official changelog, but the changes are pretty obvious. First of all, there is a major increase in performance and speed. The device moves a lot faster now and there is no more lag; this was one of the biggest issues when the S4 was launched. 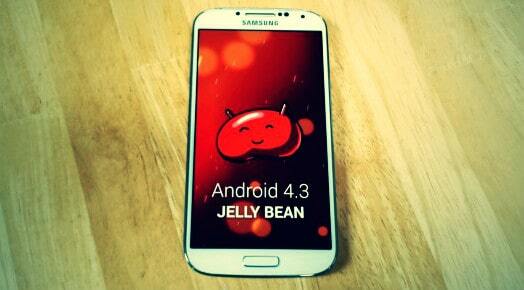 It is obvious that Android 4.3 is using the capacity of the quad core processor inside the I9505 S4 much better. The changes can also be observed with TouchWiz that is more fluid now. There have also been some changes that make the display look a lot sharper. Under the hood things look much better now. Maybe with Android 4.3 people will really feel that it was worth to pay so much for the Galaxy S4. It is finally raising up to its expectations. OpenGL 3.0, ANT+ and Galaxy Gear support. For now the update was only released in Germany but we all know how Samsung releases its updates. We can expect by tomorrow to have a bunch of other countries to get the update. If you want to manually install Android 4.3 on your Galaxy S4 I9505, because you just cannot wait for the official update to arrive in your country, you can do so by first downloading the firmware from the link below and then following the steps in our tutorial on how to manually install a firmware with Odin. How to troubleshoot AOL email account problems?